Oystein Horgmo was walking back to his office in a cancer hospital in Norway when he spotted an elderly couple sitting at the end of a corridor. As he passed them by, the couple got up, ready to leave. “The woman adjusted her wig just slightly (cancer patients undergoing chemotherapy tend to lose a lot of hair), looking at her husband to be her mirror. They nodded and they left. Just a few seconds, but to me it said everything about the horror and turmoil a cancer diagnosis sends into a normal life. The need to stay normal and the longing to lead a normal life again. And how important family members are when the lightning strikes,” wrote Horgmo in an entry titled “A sudden jolt of sadness” on his blog, “The sterile eye”. “It is challenging to shoot in an operating theatre because you have to deal with extreme contrast of light. Starting out as medical photographer, I was a bit anxious of how I would react to seeing a person being cut and dissected. It turned out that what I saw was not the challenge; rather what I smelled. I have never had problems with seeing blood in my work, but the smell of burnt flesh when surgeons use electric scalpels (diathermy) still gets to me sometimes,” says Horgmo, now with the University of Oslo’s medical faculty. Medical photographs of terminal illnesses like cancer, liver cirrhosis or brain tumour can look chillingly beautiful under the lens. The book, Hidden Beauty: Exploring the Aesthetics of Medical Science, published this year, is replete with such breathtaking images. The lacework of cells inside the human brain suffering from tumour looks more like an abstract painting in varying shades of violet. The cover image of the book resembles a collection of beautiful sea shells, which actually is a collection of gall stones extracted from patients. “Almost everybody looking at the book will have one of those diseases or know somebody who has one of those diseases... the disease becomes an identifying feature of themselves, they relate to it and want to understand it not only because they have to make important treatment decisions... but almost as if to understand something about themselves,” said Christine Iacobuzio-Donahue, co-editor of Hidden Beauty and professor of pathology at the John Hopkins Hospital, in an interview to BBC. In a way, Hidden Beauty marks the evolution of documenting medicine—from the earliest anatomy illustrations by Leonardo da Vinci, which still figure in medical textbooks, to microscopic images using cutting-edge technology that are visual treats. Still, the raison d’être for visual documentation remains the same—to track progress of a treatment, knowledge sharing among practitioners, archiving and in teaching medicine. 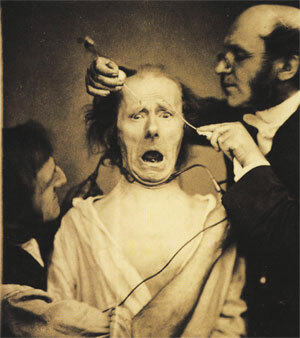 Medical photographs can also be used as a campaign tool in public health. 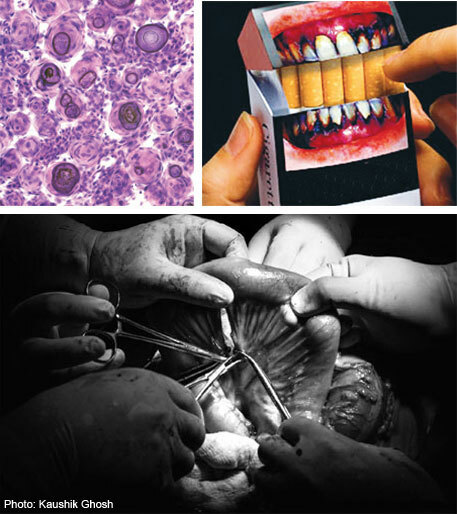 Graphic depiction of a smoker’s lungs or throat cancer on a cigarette pack can be an effective way to dissuade a smoker. A few months ago, Kaushik Roy, neurosurgeon at a state general hospital in Kolkata, operated on a rare brain tumour. “There were no photographers available and I could not remove my gloves to shoot even if I had a camera,” says Roy. “Not only is our record-keeping poor, we cannot even publish in top journals for want of visual evidence,” he adds. Medical photographers are integral to hospitals in the West, for instance at the National Health Service in the UK, as part of the medical illustration and records department. But they are rare in India. We still get shoddy photos clicked by surgeons on their phone or by dentists on their digital point-and-shoot that serves little purpose. “I have seen medical images in their worst form during presentations in conferences: too dark, too much light, lack of sharpness, important details buried or messy, serial photographs that do not match. They are casually shot with no plans to archive the work,” says Kaushik Ghosh, who set aside an MD degree in internal medicine to pursue a career as medical photographer. The imperative of documenting medicine, says Ghosh, begins with a full-time course in medical photography. At present, no medical college in India offers such a course. However, the Post Graduate Institute of Medical Education and Research (PGIMER) at Chandigarh is planning one, informs Ghosh who is designing a curriculum combining the basics of medicine, imaging and ethical guidelines. PGIMER and AIIMS, Delhi, are among the handful of medical research institutes in India with full-time photographers. “We are planning a one-year course that will initially train photographers working at government hospitals. Later, the course will be opened for outsiders,” says N Khandelwal, head of the radiodiagnosis department at PGIMER. 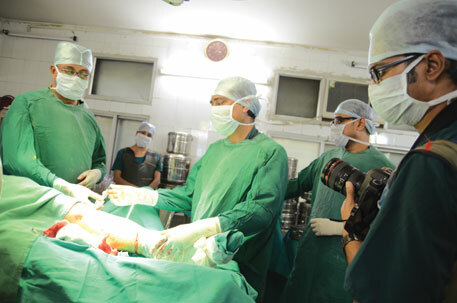 “Till now, photographers at government hospitals covered events and conferences more than diseases and surgeries. The course will train them to be skilled clinical photographers,” he adds. To learn from a surgery in progress, a student in India has little choice but to peep from behind, with 25 others crowding around. Narrative audiovisuals, say on a web portal, would be of use not only to the student but also a layperson. A patient might also want to know what’s happening inside his body. Way back in 600 BC, Sushruta, the Indian sage widely believed to be the father of surgery, described procedures such as making incisions to C-sections, reconstructing an injured nose and the first known use of anaesthesia. His book, Sushruta Samhita, had illustrations of nearly 178 surgical instruments. Sadly, we lost the original manuscript. “The West is diligent in documentation and archiving but we are absolutely reluctant to do so. Practitioners prefer to maintain medical records as technical observations on paper,” says Ghosh. Indian hospitals, even posh ones which offer luxury suites for Rs 75,000 a night do not keep visual records of cases. A possible reason, apart from the question of “who will bear the cost”, says Anjonn Dasgupta, senior surgeon in Kolkata, is that “doctors in India have medico-legal worries at the back of their heads. There is reason to believe they will feel insecure of keeping visual records of treatment procedures.” More so, when medical negligence is common. Still there are others, like neurosurgeon Kaushik Roy, who think visual documentation can help avert legal worries in future. “Suing for medical negligence is not yet a practice in India. Besides, a doctor can also be spared punitive action if visual evidence proves no negligence on her part,” he says. Henry Lou Gibson, an American photographer who pioneered the use of infrared radiation wrote in his 1973 book, “Patients are people—people with problems. They are often in pain and usually apprehensive. To them, medical photographer is someone who, once more, submits them to an institutional routine. He takes their pictures, with part or all of their clothing removed, to show what is usually an embarrassing condition or deformity. Again, indispensable as photography is in the teaching and advancing of medicine, it does not present to the patient the same direct benefit as a radiograph or a blood test.” Forty years later, a new breed of patients are thinking differently. They are eager to understand their medical condition better, and someday we may see them posting photos on Facebook! This is a particularly well-written article. The contrast between the west and India is amply illustrated, though one might want to know the situation in countries like Japan and Singapore, or the upcoming superpower China. How does Cuba do in this respect? This is not to say the article had to have all these information (if it actually had, it would no longer have been an article, but a wikipedia entry, so to say), but a few links here and there would certainly have helped. Now, coming to India's situation. What does the MCI think about it? Does the central ministry of health recognize that medical photography has to be an integral part of the medical procedure? If no, and if the doctor community, by large, believes that it is indeed important, there should be an orchestrated pressure on the government from the community itself. If even doctors are reluctant to have a photographer inside the OT (for various reasons, as implied in this article) the society has to exert pressure. Mainstream media have a big role to play here. This article is sort of a pioneering effort in that sense. I hope the mainstream media pick the thread up and start probing deep into the issue. The article mentions that apart PGI Chandigarh, no medical school even plans to offer a course in medical photography. This can indeed be taken care by the market. If the government makes it mandatory to have a photographer inside the OT whenever a procedure takes place, there will be a demand in the industry. The sheer lack in supply would certainly drive up the wage rate and that will see a surge in the number of students willing to take this up as their profession. The existing institutes will then start offering this course and new institutes will come up. Hence, it is imperative to take the government on board if medical photography needs to be a regular practice. There might be some apprehension and even reluctance at the patients' end. Photography, after all, is an invasion of their privacy. But so are procedures like USG, colonoscopy and endoscopy, to name a few. The surgery is in itself a severe invasion. We, as patients, do not object to that because we know for sure that these are integral to the treatment. It's mainly a mindset issue. If medical photography is indeed in the interest of patients and the medical science in general, I doubt whether anyone, barring a handful, would have any objection to it. Amitava, thanks much for your detailed comment and interest in the story. Honestly, I did not look into the state of medical photography, say in Cuba or China, but mainly concentrated on EU, US and the NHS in UK. It would definitely be interesting to know the situation on other countries. Say, if China is documenting its rich heritage in traditional medicine. Medical photography must be in vogue in South Korea due to its obsession with plastic surgery! As for India, the possibilities are immense. Its time we work on our visual record keeping- and as you rightly said, patients will not object. They are already subjected to a lot of intrusive procedures. I feel the onus now is on medical practitioners and administrators to argue for it. The media can play a role in awareness and increasing the acceptability of medical photography, but government institutions like MCI and union ministry of health has to take a lead. A very lucid and readable piece.Hope we have more of the breed in India. I think, instead of being an invasion of privacy, OT images can be really empowering for patients. They can serve a role similar to the RTI!Just imagine, if a patient or her relatives had the legal right to access the images of a botched operation.